Manzhuan mountain is near Xiangming, located west of Yiwu. 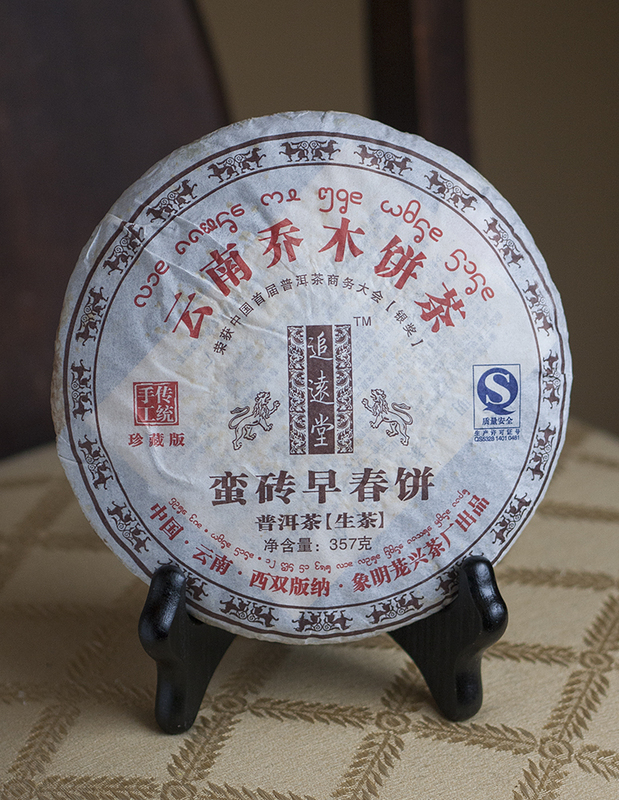 The label reads “Manzhuan Early Spring” and was pressed at Xiangming Longxing factory, near Xikong, in April of 2005. 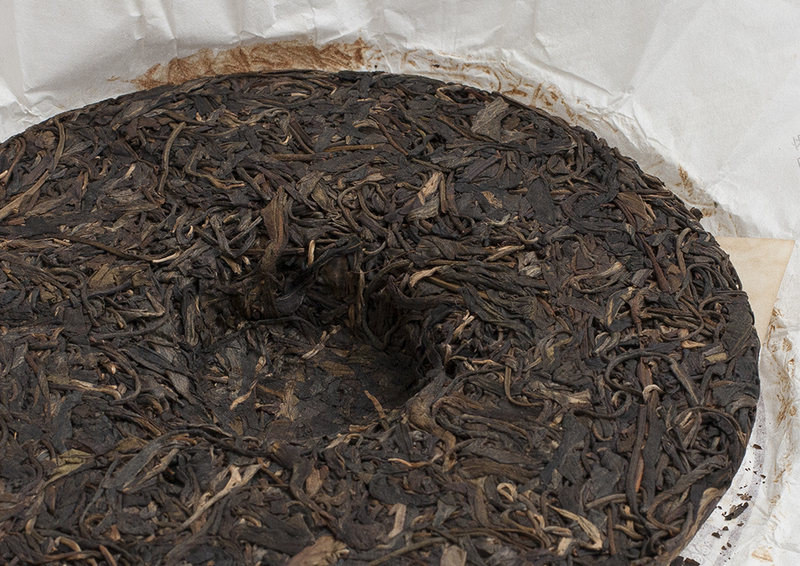 The 357g cake appears to have good quality leaves that are not tightly compressed which makes it fairly easy to break up without doing too much damage. I was originally not going to say anything about the aroma of the dry leaves, but one interesting note that came to mind from them is a hint of watermelon. Not a strong artificial watermelon, but the nice subtle watermelon aroma that I get when I’m eating actual watermelon. Setup: I ended up using about 7g per roughly 120ml and that worked great. My first infusion was about 10 seconds with water right off a boil and subsequent infusions were around 15-45 seconds then longer as it tapered off. It seems like it would be very difficult to over steep this tea. I felt that I could be very relaxed in the time between pouring the water in the pot and pouring the tea into the cup and always get a proper tasting brew. The liquor is a nice light to medium orange color and very clear. 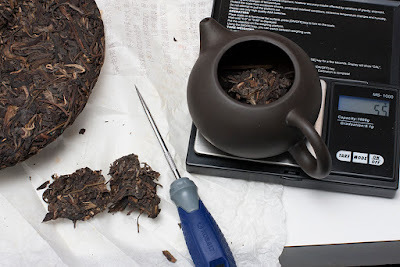 The wet leaves and tea have a really nice sweet aroma of butterscotch and apricot with distant floral notes and only very slight clay-like earthy notes, which may have been enhanced by the clay pot itself. The mouthfeel of this tea is very viscous. At first I did not detect any astringency at all, but then began to notice a hint of it-- it’s the type of astringency that is actually welcomed and seems to awaken the taste buds a bit without being dominant. The taste of the first one or two infusions is reminiscent of freshly fallen autumn leaves, and I imagine that drinking this at that time of year would greatly enhance the flavor. A slight hint of smoke is present, but I hesitated to mention it because this is not a smoky tea at all. The third and fourth steeps started to show the most floral aspects of this tea. The floral notes that were distant in the aroma come through strong in the taste here-- not as the tea hits the tongue though, but it seems to mature as a nice dominant aftertaste that lingers in the mouth for several minutes between sips. 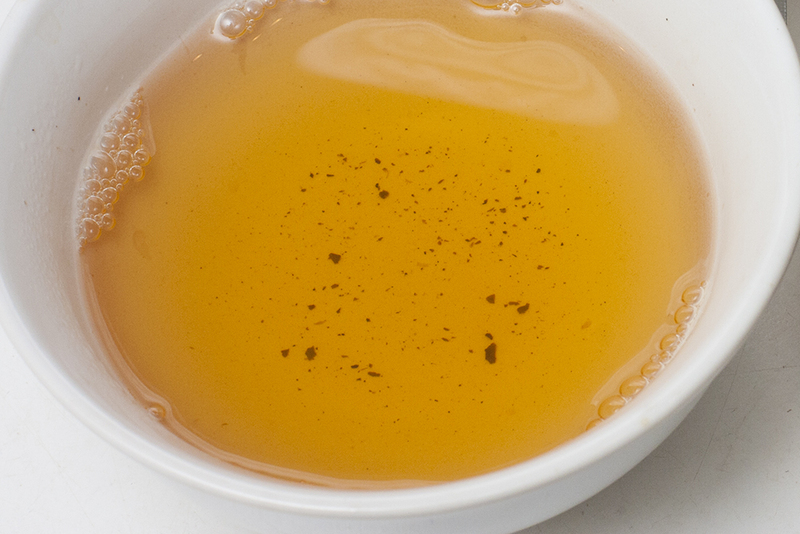 This tea is also very sweet and reminds me of honey and apricot. I lost count of how many infusions I did, but the same leaves provided me with tea all day long today, and the very late infusions had a hint of citrus fruits and orange zest. One thing that impressed me is how mellow this tea is right from the start. 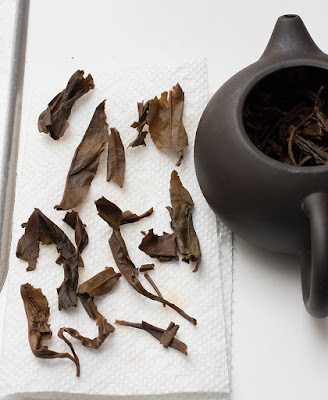 I find that some puerh are very bold and intense early on even with extremely quick infusions, and it’s not until the 4th or 5th steeping that they start to deliver a more balanced flavor profile. This tea though seems to deliver a nice balanced flavor right away, and it stays that way throughout the subsequent steepings. You may interpret this to mean that the tea doesn’t provide a huge range of complexity, but I personally think this is a nice property to have when considering a tea that I would want to drink often, even on a daily basis. I also want to point out what this tea is NOT. Compared to some other puerh, this tea is not real earthy, it does not not conjure images of tobacco and barns, it is not real medicinal or have a strong camphor taste (only very slight), and it does not have an "antique" flavor or tree bark flavor-- I do enjoy all those flavors in puerh, but sometimes it is nice to have one on the opposite end of the spectrum with its strong floral and fruity notes. That sweeter flavor profile combined with the ease at which it is to brew this tea would make this a perfect introductory puerh or a puerh for someone to try who has tried other puerh before and didn’t like it.